Author: NIKLAS TIMBY, Consultant doctor, PhD. Department of Clinical Sciences, Paediatrics, Umeå University. Globally, breastfeeding is recommended as the sole source of nutrition during an infant’s first 4-6 months of life. Infants who, for some reason, cannot be breastfed should instead be given an infant formula whose composition is strictly regulated to ensure safe nutrition for all infants. In wealthy countries, the differences between breastfed infants and those fed with present day infant formula milks are small, but nevertheless measurable at group level1. The most obvious differences are seen in growth and morbidity due to infections during the first year of life. Some of these differences can probably be explained by the differences in composition between breast milk and infant formula. We have previously reported the results from the TUMME-study (Tillväxt och Utveckling med ModersmjölksErsättning, in English: Growth and development with infant formula), which our research group is carrying out at Umeå. We are studying the effects of a new, experimental infant formula with reduced energy (60 compared to 66 kcal/100ml) and protein (1.20 compared to 1.27 g/100ml) contents. Milk fat globule membrane (MFGM) from cow’s milk has also been added to this new formula. We recruited 160 infants who had stopped breastfeeding before the age of 2 months and randomised (assigned) them to either receive the new experimental formula or a conventional formula up to the age of 6 months. A breastfed reference group of 80 infants was recruited in parallel. In order to measure morbidity due to infections we asked the parents to keep a diary of all symptoms of illness, contacts with health care, and medicines given during the infant’s first year of life. “The most obvious differences are seen in growth and morbidity due to infections during the first year of life”. The results from the infection part of the study are published in the most recent issue of the Journal of Pediatric Gastroenterology and Nutrition (JPGN). We found that infants who had been given the new formula had significantly fewer infections that led to hospital care or prescriptions for antibiotics up to the age of 6 months compared with infants who had been given standard formula; they did not differ from the breastfed reference group. 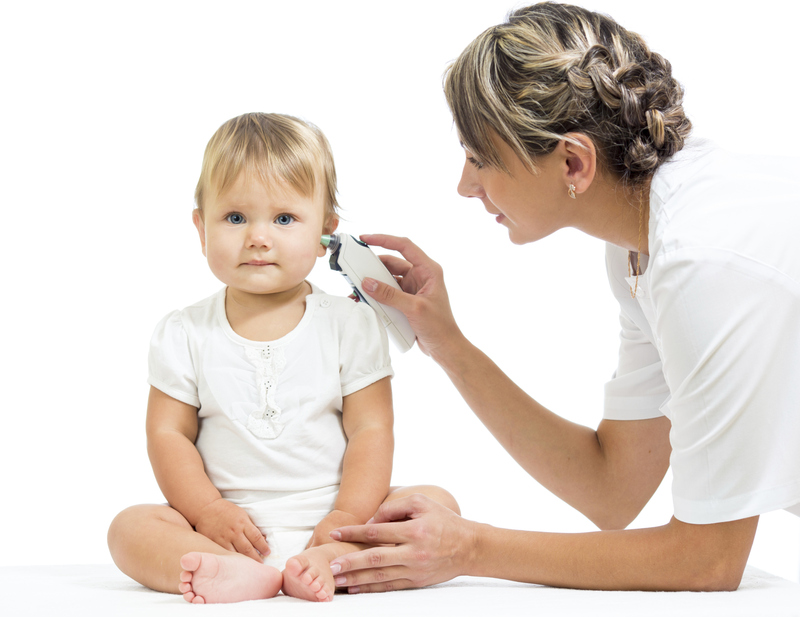 The most common type of infection was otitis media; infants who had been given the new formula also had significantly fewer episodes of otitis media up to the age of 6 months compared with infants who had been given standard formula (see Figure). We also found that infants who had been given the new formula used less fever-reducing medicines than those who had been given standard formula, a further indication that they had suffered fewer infections. Figure 1. 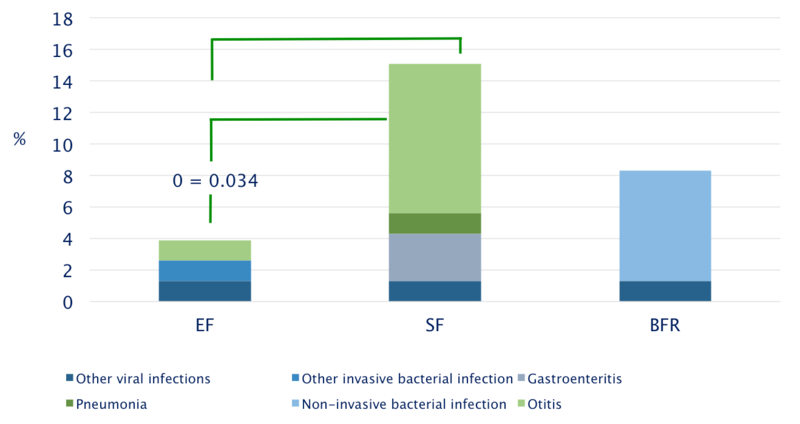 Incidence of infections from inclusion in the study up to 6 months of age for infants who had been given the new experimental formula (EF), standard formula (SF), and the breast fed reference group (BFR). Our interpretation of the results is that the addition of MFGM to the new experimental formula has given increased protection against infection. MFGM is quantitatively a small milk fraction, but has been shown to have biological activity in various areas. Both the lipid component and several of the integral membrane proteins have antimicrobial and immunogenic effects that can play a part in the defense against infections. Our study is the first to study the addition of MFGM to infant formulas. We have previously presented positive effects on both cognitive development and cholesterol levels. The effect on infection strengthens the picture that MFGM is an important milk fraction for infants, but the results need to be confirmed by further studies before the addition of MFGM to all infant formulas can be recommended. The composition of MFGM in cow’s milk and breast milk is similar. The preservation of the structure through evolution may suggest that the fraction has been important for health and survival. MFGM has previously been lacking in infant formulas because this fraction disappears when the milk fat is replaced with vegetable fat to give a more favorable fatty acid profile. Or, as Professor Mary Fewtrell from University College London, Institute of Health puts it in a comment to our article in the same issue of JPGN: “A Case of Throwing the Baby Out With the Bathwater?”. Thanks to new methods that facilitate cleaning of the MFGM fraction from cow’s milk so that it can be added to the formula afterwards, we may have taken a further step in reducing the differences between breastfed and formula fed infants.